Heated socks might be the best invention for hunters in recent years. These socks protect your feet in any conditions, and they distribute pleasant warmth across your feet and legs. Did you know that the best hunting socks for cold weather can run for up to 6 hours or more? We present the best 6 heated sock models and explain how they can improve your hunting. 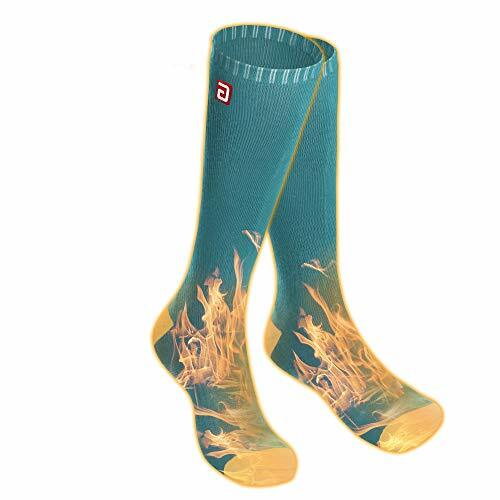 These heated socks by Autocastle have a good design that will keep your feet and calves warm during the coldest days. These electric heated socks use two 3.7V batteries to spread pleasant warmth over your feet. One of the advantages of using these socks is that they come with an adjustable temperature setting. You can choose from three settings, low, medium, and high. The control panel’s LED lights will indicate the temperature, so you always know what setting you chose. The socks are made out of cotton and they have a full elastic arch design that will wrap tightly around your calves. This will help the socks to retain all the heat close to your skin. Even though they’re battery-operated, the socks produce heat for a long time. You can use them for up to 6 and a half hours, depending on the temperature setting you select. Overall, these socks are very efficient at warming up your feet, and they are comfortable to wear for a long time. 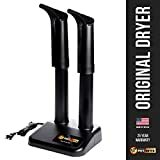 The Rabbitroom Unisex Rechargeable Battery Electric Heated Socks are very good at warming up your toes and feet in the cold weather. These socks are made of cotton, and they’re specially designed to produce and distribute the warmth across your feet and legs. A great thing about these socks is that they’re comfortable. The socks are made out of a non-scratchy material that won’t chafe your skin. The battery compartments won’t bite into your leg and sits just below your calves. Every pair of socks comes with two 3.7V lithium rechargeable batteries and an AC electric charger. These socks distribute the warmth directly to your toes, so you won’t have to wiggle them to keep them warm in cold weather. All in all, these are great heated socks and they will protect your feet against the bitter cold. The TherMedic heated socks provide an efficient way to keep your feet warm when you’re hunting in the cold season. 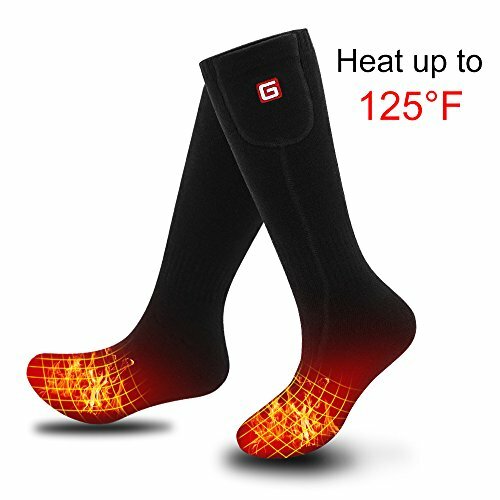 These socks use the Far Infrared Ray technology to produce warmth, so there are no chances of burning your skin while you’re using them. Not only will using this technology protect your feet against burns, but it will also allow the warmth to penetrate deeper into your skin. This will keep your feet more comfortable than using other heating technologies. One of the advantages of using these socks is that they use AAA batteries for power. AAA batteries are cheap, especially if you buy them in bulk, and easy to find. The socks produce the heat directly against the sole of your foot, and from there, they will distribute it upwards on your leg. This will keep your feet at a warm temperature even if you spend a long time in cold weather. 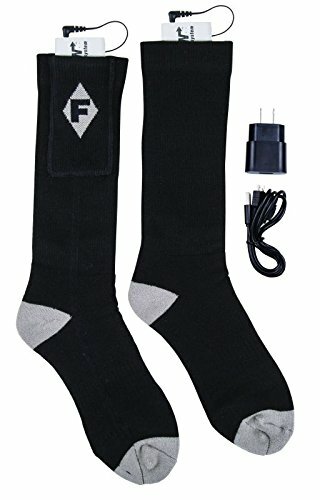 These socks are very good, and using the FIR technology actually offers health advantages, besides keeping your feet warm. The electric heated socks produced by Lenz Products is one of the most efficient models currently available. They are made out of a combination of polyester, polyamide, merino, elasthan, and polypropylene that’s specially designed to keep your feet warm and dry even in cold and wet environments. A great thing about these socks is that they’re Bluetooth compatible. This feature will allow you to make any adjustments through your phone, instead of having to lift your pants and bend over to use the control panel directly. These socks come with 3 temperature settings when you’re using them manually and 6 settings when you use the app, and each of them is noticeably different. The socks use Lithium batteries for power. The batteries can provide a comfortable warmth for up to 14 hours of continuous use, depending on the temperature setting you use. Even though these socks come at a pretty steep price, they’re very efficient, and they will keep your feet warm and snug while you’re out hunting in the cold. The Greensha unisex heated socks come with three temperature settings. They are made out of cotton, and even though they’re thick, they will allow your feet to breathe. These socks have reinforced heels and toes, so they will provide more warmth to the most sensitive parts of your feet. The tops of the socks are made out of an elastic material, so they will wrap themselves around your calves to keep the warmth next to your skin. A great thing about this model is that it distributes the heat directly to your toes. From there, the heat will be distributed across your feet, so you will feel comfortable throughout the day. The socks are powered by 3.7V rechargeable batteries that can provide enough power to keep the socks working for up to 6 hours. The electric charger can recharge both batteries at the same time, so you will have them ready for your next outing in no time. Overall, the Greensha socks are efficient and comfortable, and are competitively priced. It can be difficult to decide on a pair, considering all the different models and price range. However, if the difference between a great hunt and coming home empty-handed is a good pair of electric socks, what would you choose?? The socks’ material is very important, and it will determine how comfortable you feel while wearing them. Each manufacturer uses a different combination of materials for their socks, so you will find a pair of socks that will feel good to you. Mostly Cotton – Even though cotton might seem a mundane material, most manufacturers use it for their socks because of its properties. Cotton insulates your feet, but it also allows them to breathe. Tightly knit cotton can be a very good insulator by itself, but most manufacturers also use other materials to enhance the cotton’s natural insulation proprieties. One of the most common additions you’ll find when buying a pair of cotton socks is a thin ring of elastic at the top of the socks. Not only will these elastic fibers keep the sock stretched on your calves, but it will also provide the necessary friction to keep the battery in place. Wool – Some manufacturers use wool instead of cotton for its insulating proprieties. Wool socks are more efficient at keeping the warmth next to your feet, but they can have some disadvantages. Even though wool is a very good insulator, it’s not very efficient at allowing your feet to breathe. This is a disadvantage because it may make your feet sweat. However, heated wool socks are excellent at warming up your feet. The heating element produces and spreads the warmth across your feet, but the wool will keep most of it right next to your skin. This makes the wool socks a great addition to your gear if you’re planning on spending time with your feet in the snow. Synthetic Materials – Some manufacturers rely on synthetic materials for their heated socks. Even though most people don’t think synthetic materials are the best choice for their heated socks, they might be mistaken. It’s true that more people might be allergic to different synthetic materials than wool or cotton, but these materials can be very effective. Different synthetic materials can keep your feet warm while allowing them to breathe. Socks made out of synthetic materials can often remain comfortable, even if you somehow get them wet. They might dry faster than both cotton and wool, and they might offer a better insulation. These socks might be the right choice if there is a chance of submerging your feet in icy water. The way the materials are combined is also very important. Some manufacturers use a simple design for their socks, but most of the top ones use a three-layered design that will keep your feet both dry and warm. 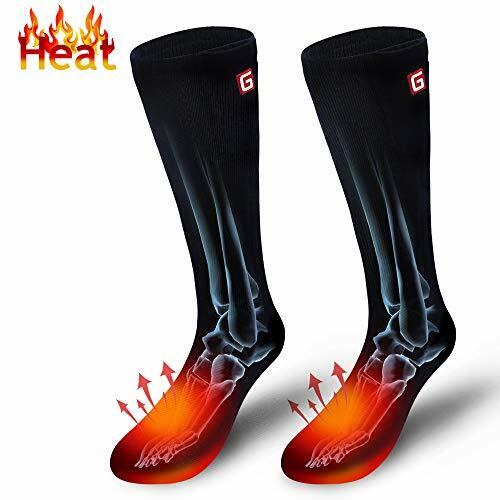 Even though most manufacturers use a similar type of heating element for their heated socks, the placement of the heating element can provide a different experience while you’re wearing the socks. Some manufacturers place the socks’ heating element directly above the toes. This can be very helpful in the cold weather, especially since your toes are the first things that feel cold when you’re out hunting. The heating element will start warming up your toes, and then it will distribute the warmth across your feet. Another good aspect of having the heating element placed directly above your toes is that the front of the socks will often be reinforced. The extra material will provide both extra warmth and padding for your toes. Some manufacturers place the heating element directly over the arches of your feet. This placement offers some obvious advantages. The arches of your feet are located on the middle between the toes and the heel. When the heating element is in use, you will be able to feel the warmth distributed across your whole foot. Having the heated elements placed on the arches of your feet might also make the socks more comfortable to use. Even if the heating elements are thin, most people can still feel them with their toes, whereas the arches are not so sensitive. Having the heating elements placed on the soles of your feet can be a real advantage, especially if you spend a lot of time out hunting in the winter. The soles of your feet often get wet and cold, and having the heating elements there will protect them from the elements. One of the advantages of having the heating elements placed on the soles of your feet is that they will distribute the warmth fast across your feet. Both your toes and your heel will feel the heat in a short amount of time, and that will help you feel comfortable when you’re out in the cold. Manufacturers use two types of batteries for their heated socks. Both offer certain advantages and disadvantages. Rechargeable Batteries – The main advantage of using rechargeable batteries is that they’re very economical. Once you buy the socks, you know you won’t have to spend any more money on their maintenance because the batteries are rechargeable. These batteries have a variable lifespan, depending on their capacity and the heating features you use. Even though some models can produce power for only a couple of hours, others can run for over 6 hours. Some batteries come with a dedicated charger and others use a USB cable to recharge. There are lots of USB ports around these days so it is not hard to charge your USB socks. The main disadvantage of using rechargeable batteries is that you can’t replace or recharge them on the run, without an extra power source. If your sock batteries run out, you’ll have cold feet for the rest of the day. AAA Batteries – The main advantage of using AAA batteries to power your socks is that you can always keep spares on hand. When you notice your socks are not producing as much warmth as they did at the start of the day, you can simply take them out and replace them with spares. The lifespan of the AAA batteries is different, and it’s closely related to the model of socks you’re using, the heating feature in use, and of course, the batteries’ quality. Even though they seem small, AAA batteries can store a good amount of energy, especially if you buy alkaline models. Another advantage of using this type of batteries is that you can find them easily. Even if you forget to take spares with you, you can still buy a new pair from the local gas station or store. If you believe that the only function of the heated socks is heating, you’re mistaken. Basic Function – The most basic heated socks can only turn the heating on and off. You cannot increase or decrease the amount of warmth. If you think your feet are warm enough, you simply turn the unit off. Even though this design is not very sophisticated, this kind of battery heated apparel can still be very efficient, and it will keep your feet warm throughout the day. Adjustable Temperature – Some models offer an adjustable temperature feature. You can select one of the three (or more) temperature settings the socks offer. This is a great feature because it makes the socks more versatile. You don’t necessarily have to wear them during the winter when the temperatures are very low. You can also wear them using the low heating mode during the spring or autumn, when the temperatures are milder, but still not warm enough. Most models use a color-coded system to let you know what heating setting you’re using. The red temperature setting will produce a lot of heat, and it’s suitable for cold winter days. The orange setting is the medium heat level. This setting will produce enough heat for most winter days, but you can still use it to warm your feet during the chilly spring or autumn hunting sessions. The green setting will produce enough heat to warm your feet when you’ve just put your hunting boots on for a cold spring morning. Bluetooth Compatibility – Since you can control everything using your smartphone these days, why shouldn’t you be able to control your socks through Bluetooth as well? Some manufacturers used exactly this idea to create their products. 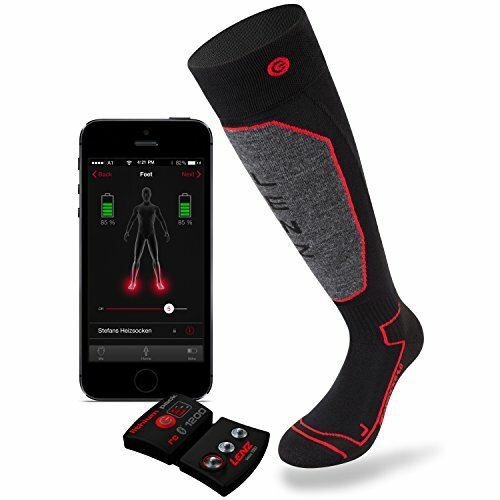 You can connect the heated socks to your phone and control them through an app. This can be a great feature when you’re out hunting because it will allow you to control the heat without having to bend over to press any buttons. You can maintain your stance, and adjust the temperature using the app. As you could see from the models we reviewed in this article, heated socks come at different price ranges. Here’s how to determine how much you should spend on a pair of socks. Cheap Socks – Some heated socks models come at a great price. That doesn’t mean they won’t warm up your feet. Even though they’re cheap, they can still be very effective. However, most of these models don’t have an adjustable temperature setting, so they will always produce the same amount of warmth, no matter in which season you’re using them. Most of them don’t come with a rechargeable battery, so you will have to invest some money in AAA batteries as you use them. Medium-priced Socks – These heated socks are not too expensive, but still a lot more than regular socks. However, most of these models are very efficient. They warm up your feet really well in the cold season, and they come with an adjustable temperature feature. They’re usually made out of high-quality materials that will keep your feet dry and warm, and they often come with a rechargeable battery. Expensive Socks – Expensive heated socks will may cost quite a bit, but that doesn’t mean you shouldn’t invest in a pair. When you’re looking for the best tactical outfit, you shouldn’t neglect your feet. If you also have an insulated winter boot, these socks can produce a lot of heat, and most of them offer more than three levels of warmth, which makes them more versatile than other models. These models may also offer Bluetooth compatibility, so you can control them through your phone instead adjusting your gear. These features make them very efficient, but you should be very sure you’re actually going to use all of these features if you’re willing to go the extra mile and buy an expensive pair of heated socks. As you could see, heated socks come in different price ranges and offer a range of features and functions. However, not everyone needs a high-tech solution to warm up their feet when they’re hunting. For some people, the best heated socks for hunting are those that don’t cost much and last for a long time. For others, there is no expense too high if it means you bring home the big trophy you’ve been searching for.